Railway passengers in the restive Seema-Andhra region of Andhra Pradesh are bearing the brunt of ongoing strike by employees of state power corporations with many trains are either being partially cancelled or rescheduled. 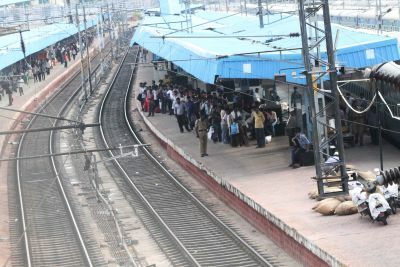 The South Central Railway on Monday partially cancelled services of passengers trains running on Rajahmundry-Visakhapatnam and Vijayawada-Visakhapatnam routes in the wake of the strike by employees of Andhra Pradesh Power Transmission Corporation. Employees of all three wings viz generation, transmission and distribution are on strike in protest against Centre's decision to carve out separate Telangana state. While Rajahmundry-Visakhapatnam passenger train which left at 11:15 hrs was partially cancelled between Anakapalli and Visakhapatnam stations, a passenger train running between Vijayawada and Visakhapatnam station was partially terminated between Anakapalli and Visakhapatnam, according to a SCR spokesperson. The Tirumala and Konark expresses were stopped at Tuni and some services are running behind the schedule, he said. Meanwhile, the South Central Railway has set up a helpline at major stations like Vijayawada, Nellore, Ongole and Rajahmundry to update passengers about the schedule. Anticipating power disruptions in coming days due to strike, the SCR is keeping various options open, including hauling important express trains with diesel locos. Locomotives are kept on standby along Vijayawada-Gudur- Renigunta section. "Another measures the SCR has planned to roll out in case of emergency situation are suitable diversions of long-distance trains via convenient alternate routes, shutting down goods trains and cancellation/partial cancellation of short-distance passenger trains to facilitate movement of express trains," the spokesperson said.